Are you trying to decide between Tapestry of Grace and Sonlight? Here is a Tapestry of Grace vs Sonlight Curriculum Comparison. Both programs provide tremendous exposure to literature. In addition, they both integrate history, geography, and Bible and each is written from a Christian perspective. 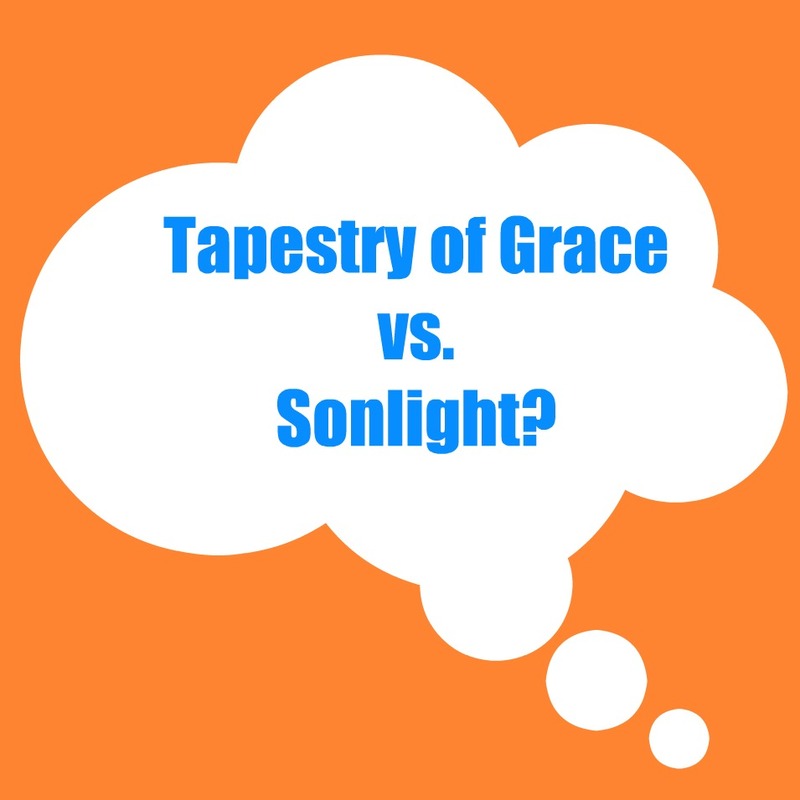 Here are some major items to consider in comparing Sonlight to Tapestry of Grace. Use Living books. What is a Living book? Lampstand Press sells only the TOG year plans. (They don’t sell any books or any materials from other curricular areas such as math, science or grammar). Sonlight is a Complete curriculum provider and sells packages that include the literature books as well as other materials. The entire program consists off 4 year-plans covering all of world history 13 different core packages (excluding 2 additional preschool cores) are available. If you are seeking a history curriculum that integrates other subjects as both Tapestry of Grace and Sonlight do, the choice between these programs is a matter of personal preference. I have specifically NOT provided a list of pros and cons concerning these curricula, because the things that I deem to be positives, might be considered negatives by someone else. I hope this comparison aids you in your decision. Be sure to visit the above links to learn more about these curricula. And, because I think it bears repeating [smile]: Each Sonlight Core is almost completely reusable when your younger children get to that point. great comparison chart! i've never used ToG but alway wondered about it. We have used Sonlight for years – every family puts their own spin on any curriculum. Thanks for posting this – very helpful! Good comparison, Kristen. I thought this was helpful and passed it along. Seems to me that the elephant in the school room is having 4 students. At that point, doesn't it make a HUGE amount of sense to go with something like Tapestry of Grace, where (even if kids are a different levels), you basically can prepare once and deliver multiple ways. There are only so many hours in a mom's day. Not only that, the kids can reinforce each others learning (can I get a chest bump from the father's?). If you have 1 or 2 students, seems that you have more options, but once you have more than that, you have to economize somehow. TOG is smart that way, I think. What do you think? Well Ken, Sonlight would not advise you to try to do 4 different cores at once. Although there are enough cores for every year, they're not grade specific. Sonlight would help with which cores are good to combine so the family is on a similar topic too. I think Sonlight would be easier to use with 4 students than a traditional textbook program with everyone doing their own history, science, math, English, spelling, etc. Tapestry of Grace has the advantage of already being combined for you, but students of widely varying ages will be using different resources so it would still be tough to juggle everyone. I think the goal is to teach students to work more independently as they get older so that which ever program they use in high school, the parent is more of a coach than a teacher. Basically, it's hard to homeschool:-) I don't remember them handing out the super hero capes when I signed up. Wow, I'm impressed with the comparison. I think you hit it pretty well. I reviewed TOG last year and have used SL in the past and will this coming fall. I like both of them, SL just fits us better at the moment. My best friend uses TOG and adores it. I'm just glad they are both available and both great curricula! Good comparison, hopefully it will help those deciding between the two (that's where I was a couple months ago!). It's a tough call but understanding the differences can help make the decision on which would work best for YOUR family. That is a great comparison chart. Thanks for posting! I have been looking into ToG. It's so difficult and overwhelming to investigate curricula options and then try and choose! Thank you for the excellent overview. We used Sonlight with our four sons, but mixed and matched and adapted freely. We focused on one core, but pulled in books from other cores as appropriate. ToG didn't come along until we were almost done, so I didn't get to try it, but I would have used it in the same way– picking and choosing, adapting and tweaking to fit our boys. That's the best part about homeschooling– it can be custom tailored! Thanks! That was helpful! I wish I could pick & choose between the both of them! Mainly I wish ToG had less parental planning like SL does, but the rest of the differences are what I love about Tog! Great job. We used SL for 6 years, I think, and just finished our first year of TOG. Both have suited us very well (two children, 2 years apart). During the last year with SL, I was struggling with some mild depression due to a recent move and some other life issues. I found that we were failing to get things accomplished b/c so much depended on ME—I needed to do book discussion with them, needed to help the younger with the World Book program, needed to constantly tell them what to do next—and I simply was not up to it. The change to TOG this year has helped both children (ages 10 and 12) become more independent. I spend a few hours each week writing up assignment sheets for each child, then they are able to run with it rather than feeling like they can't move on without me. They are able to do a couple of days of independent work before time for discussion. So I think both are wonderful, and much depends on family dynamics, stylistic preferences, and desired level of parental involvement. THANK YOU, THANK YOU, THANK YOU! This post is an answer to my prayers for clear direction concerning which curriculum to use next year. I had narrowed it down to TOG or SL, but I’ve been wishing I could talk to someone who had used both to get a compare/contrast of the two. I googled it tonight, and here you were! MUCH APPRECIATED!!! Blessings to you. this is great! I am really struggling to decide whta direction to go with my 8 yr. old. She is my youngest, so I don’t have to juggle a few children…I am not a very hands on person and she is not either, but I need to keep it fun, also. We have used SL for years. I only had one child doing TOG. I ended up ditching the program part way through the year and this year we came running back to SL. I DID like the integrated Bible with TOG, but the binders are SO big for just one child that I was overwhelmed. Still, we kept many of the books the TOG suggested to use as supplements for SL in future years. I need to add that if ALL of my children were in the same year of history, then TOG would be a great fit, but there really IS a lot of teacher planning. As it is, all of my kids ended up in different history time periods so I didn’t want to derail them and plop them all in one with my daughter. For those who do not know…there are 4 very large binders full of information. And there is a LOT of reading on the part of the teacher just from the binders. A lot of the direction and discussion was very much aimed at the older children and not at the lower levels – which is probably why I thought the program was just too much for my daughter.